Israel on Wednesday demanded the release of an Israeli soldier seized by militants more than two years ago as a condition of lifting its economic blockade on Gaza, a government spokesman said. Gaza’s Hamas leadership rejected the decision by Israel’s Security Cabinet to link the release of Gilad Shalit to the lifting of the blockade. Hamas insisted Shalit’s release was a separate issue from the cease-fire deal under which the blockade lifting was agreed. 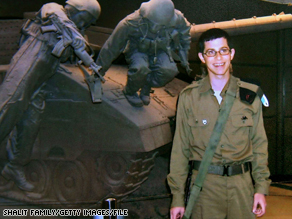 “Gilad Shalit and attaining his release is our top priority,” Israeli spokesman Mark Regev told CNN. “The people of Gaza are not our enemy. But a wider opening of the crossings is contingent upon the release first of Gilad Shalit.” Hamas is under pressure to alleviate economic suffering in Gaza compounded by border closures. Israel allows limited humanitarian aid into the Palestinian territory, which has been under international embargoes by countries — including the United States — that consider Hamas a terrorist organization. Israel’s announcement came two days after Hamas said that it is willing to consider Shalit’s release, but not as part of a broader cease-fire agreement. Egypt meanwhile is attempting to broker a more detailed cease-fire between the two sides, which Regev said includes “trying to bring about the release of Gilad Shalit,” in addition to “trying to achieve long-term quiet” in southern Israel. Shalit was 19 when he was captured in June 2006 by Palestinian militants from Gaza, including some linked to Hamas. The militants tunneled into Israel and attacked an Israeli army outpost near the Gaza-Israel-Egypt border, killing two other soldiers in the assault. Israel immediately launched a military incursion into Gaza to rescue Shalit, but failed. Outgoing Israeli Prime Minister Ehud Olmert is also under pressure to secure Shalit’s release as part of a broader cease-fire deal. There is speculation he is trying to complete this before leaving office in the next few weeks. Last month, Israel temporarily halted a three-week military operation in Gaza and declared a unilateral cease-fire that did not include Shalit’s release as a condition. Hamas later declared its own unilateral cease-fire. Israel launched the military operation on December 27 to halt rocket attacks on its southern communities and towns, which it blames squarely on Gaza’s Hamas leadership.